Here you see the crimp of our champion, Beethoven's fleece. Shasta Rose with her cria. Mr. Paint It Black kushed down. Laddie shows off his great conformation. 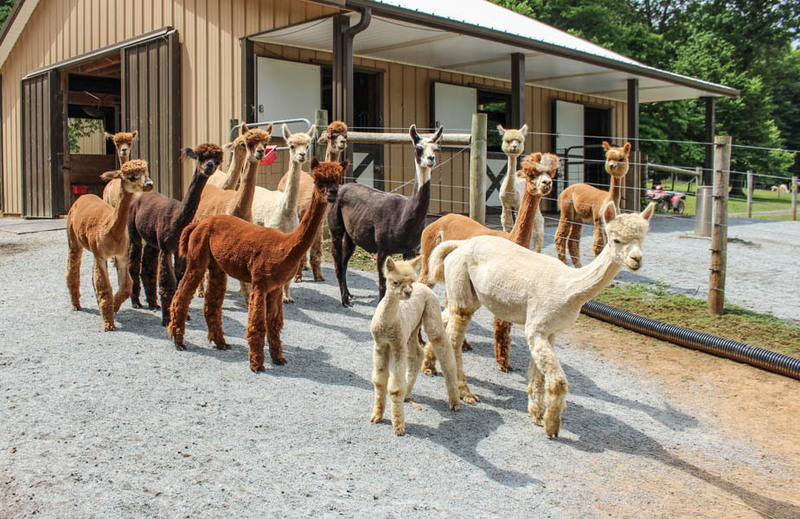 AOA: (Alpacas Owners Association) Created in 2014 when Alpacas Owners and Breeders Association, Inc. (AOBA) merged into Alpaca Registry, Inc. AOA is the world's largest alpaca association with nearly 10,000 members and over 230,000 alpacas in its registry database. Located in Lincoln, Nebraska, it provides services and support for the North American alpaca industry. Agist: When you board your alpacas at another alpaca farm. Blanket: Alpaca fleece of the highest quality, which starts at the shoulder, runs along the back and down each side and meets in the medullated belly fiber. Does not include belly, neck, leg, chest or britch. The image of a horse's saddle blanket is the origin of the term. Camelidae: Camelids, including camels, llamas, guanacos, and vicunas. Alpacas are part of this larger biological family (lama pacos). Character: Overall evaluation of an alpaca fleece after examining handle, staple length, fineness, density, luster, and softness. 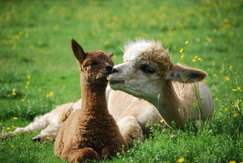 Conformation: The shape or contour of the alpaca’s body, or an appropriate arrangement, or balance of all body parts. Covering Sire: A term used to describe the male that a female has been mated to. Primarily used during the process of mating for record keeping and when the female is confirmed pregnant. Crimp: An even, corrugated undulation along the length of a fiber or lock (looks like an 'S' wave). A higher number of crimps per inch often indicates a finer fiber. Dam: A female parent or an alpaca's mother. 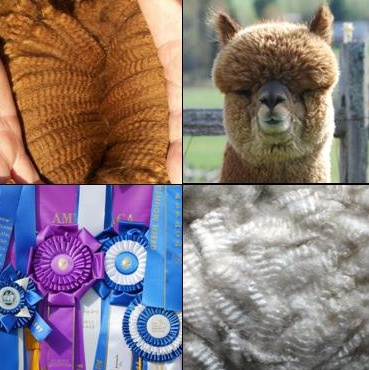 Density: The number of fibers from an area of an alpaca's body. Fiber: The fleece of the alpaca, also known as wool. A unit of matter characterized by having a length at least 100 times its diameter or width. Fineness: A measure, in microns, of the diameter of individual alpaca fibers; most often expressed as an average for a representative sample. The diameter of natural fibers measured in microns and generally varying from 20 to 36 microns, with the lower numbers indicating finer fibers. Fleece: The entire wool coat, sheared from an animal at one time, usually once a year. Gelding: A male whose testicles have been removed rendering him unable to reproduce. Usually done between 18-24 months and helps to stabilize the quality of the male's fleece. 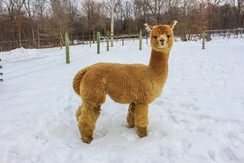 Hembra: Female alpaca or animal. Handle: The way an alpaca fiber feels when touched; often used as a synonym for "softness." Herdsire: A male alpaca with genetic characteristics desirable for breeding into a herd. Histogram: A graphical representation, similar to a bar chart in structure that organizes a group of data points into user-specified ranges. Humming: a sound alpacas make when they are happy, concerned, uncomfortable or curious. Different styles of hums indicate different emotions. Huacaya: A breed of alpaca characterized by a well-crimped fleece that grows perpendicular to the skin. 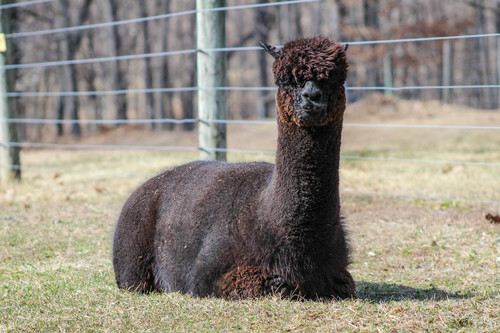 Kush: A resting position in which an alpaca is sitting down with its legs bent under its body. Lama Pacos: The Latin name for the alpaca. Luster: The glowing sheen desired for alpaca fiber. Maiden: a female alpaca old enough to breed but who has not bred yet. Micron: A measurement of fiber diameter, equal to 1/25,000 of an inch, or 1/1000th of a millimeter, that refers to the fineness of a fiber. The smaller the micron, the finer the fiber. Orlging? : The grunting sound that a male alpaca makes when breeding that induces ovulation in the female. 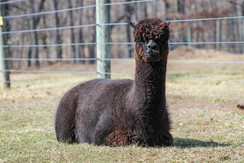 Pinto: A two colored-animal that has large patches of one color marking the overall second color of the fleece. Prime fleece: The most high quality fleece an alpaca will ever produce, usually its first coat, called tui. Pronking: A verb that describes alpacas’ version of skipping. Much like hopping around with all four feet hitting the ground at the same time. 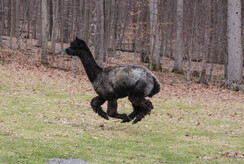 Alpacas do this when they are happy, most often around dusk. Cria are most likely to pronk but older and even very pregnant alpacas will pronk. Shearing: The once-a-year harvest of alpaca fiber. Shearing is normally done in mid-spring in order to help cool the alpaca through the summer and allow the coat time to grow back before the cold winter. Stud: A male alpaca used for breeding progeny. Suri: An alpaca type, known for long "pencils" of non-crimped fiber resembling dreadlocks. Its locks of fleece lay close to the body, twisting vertically toward the ground. Tui: A six to eighteen-month-old alpaca, or its fleece. The most high quality fleece an alpaca will ever produce. Weanling: A weaned alpaca less than one year old that is no longer nursing. Yearling: An alpaca aged one to two years.